The Expert Institute hosts the third iteration of its popular Best Legal Blog Contest. With 14 days left in the contest, the competition between hundreds of blogs is beginning to heat up. The Expert Institute’s Third Annual Best Legal Blog Contest is in full swing, with more than 500 legal blogs competing across 9 different categories. 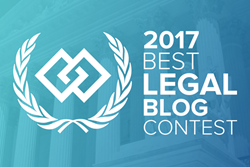 Building on the massive response to the contest over the past 3 years, the 2017 iteration of the contest has once again brought together legal blogs and bloggers writing on the full spectrum of legal topics ranging from federal courts to forensic science. This year’s contest has seen the return of many competitors from previous years, as well as a slew of new competitors that were nominated by Expert Institute blog readers during the contest’s month long nomination period. This year, the nomination period was fiercely competitive, with thousands of blogs from across the web being submitted for consideration by their readers. Now, during the voting round of the competition, each blog is competing for rank within its assigned category, while the three blogs that receive the most votes in any category will be crowned overall winners. With 14 days left in the contest, the competition between hundreds of blogs is beginning to heat up. Already, more than nine thousand votes have been cast for blogs in every category, and the pace of voting is expected to increase sharply during the final weeks of the competition. The competition will run from September 25th until the close of voting at 12:00 AM on November 3rd, at which point the votes will be tallied and the winners announced. Founded in 2011, The Expert Institute is a technology-driven platform for connecting qualified experts in every field with attorneys looking for technical expertise and guidance on their most important cases. The Expert Institute combines a vast database of pre-screened experts with a talented case management team capable of custom recruiting the world’s preeminent subject matter experts. The Expert Institute also maintains one of the internet’s most visited blogs on expert witnesses, in addition to an extensive case study archive and expert witness resource center.